AndyG3 1 year, 1 month ago. THIS IS AN INITIAL BUILD WHICH MAY NOT BOOT AT ALL. HAVE A BACKUP BEFORE FLASHING THIS AND TRY AT YOUR OWN RISK. Installing a custom ROM on a LG G3 Dual (g3ds) requires the bootloader to be unlocked on the LG G3 Dual (g3ds) phone, which may VOID your warranty and may delete all your data. Before proceeding further you may consider backup all data on the phone. You are the only person doing changes to your phone and I cannot be held responsible for the mistakes done by you. – Here is theTWRP update guide for the LG G3 Dual (g3ds). This TWRP recovery guide requires an unlocked bootloader on the LG G3 Dual (g3ds). Download and Copy the GApps and LG G3 Dual Lineage OS 14.1 ROM ZIP to your phone. First flash the LG G3 Dual Lineage OS 14.1 ROM ZIP from device. Then flash the GApps zip from your device memory. Reboot and Enjoy the Nougat 7.1 Lineage OS 14.1 ROM for LG G3 Dual (g3ds). 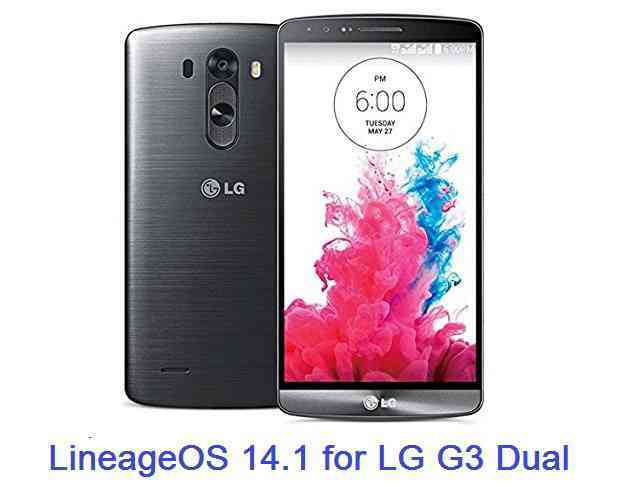 Copy the latest LG G3 Dual Lineage OS 14.1 ROM ZIP file to your phone. Stay tuned or Subscribe to the LG G3 Dual (g3ds) forum For other Android Nougat ROMs, Lineage OS 14.1 ROMs, other ROMs and all other device specific topics. If you have any concerns or found any BUG on this ROM then you can report in the forum thread @XDA. Hi @andyg3, which ROM are you looking for?? I think the LineageOS 14.1 for LG G3 Dual is already available. Will there be a new update for Ram for this model? Will there be another update for this ROM? There is a new update on 28th August 2017. You can try that update. Thank you provide such an good ROM. This ROM works well on my lgg3-d859. I have try the two different type the 7.12ROM. interval seconds.So the phone can’t use to guide..
2)Is FMradio don’t work. in both the two rom. The bug is when restart or sometimes take the battery off and restart,the phone need to take 1-30minute or even longer to find the signal,before than the phone can’t make a call or send massage. I think the first one is most important BUG. 1)i have two phone,them both lggd859,there has the same problem in above of 1-2-3. 2)when i use the lg office rom.there don’t have the above problem.